Hi there! I’m popping in super quick today with my Stamp of the Month entry over at From the Heart Stamps. This beautiful set is called Time to Bloom and here it is! If you played along last month this would have been sent to you for FREE and if you link up using this months image you’ll get the Stamp of the Month for May FREE too – and on it goes! If you love this though and didn’t play along last month you can still purchase this in the store – or if you spend over $10 in a single order you can enter the code TICK-TOCK and you’ll get it for FREE! All challenge rules can be found HERE. As you can see you get a lot of sentiments in this set – great fonts – aswell as the main image and 2 smaller images. I have printed the butterfly out 3 times here so that I could decoupage the top wings to give some dimension. I was intending to use the main image but because I didn’t have time to colour it in I just went for a CAS look with the butterfly and sentiment. I also used my Spectrum Noirs, orange and black Coredinations cardstock and some black adhesive flat-backed pearls. I also cheated a little bit with the antennae! I had cut them off while I was cutting them out, so I used a butterfly die to cut out another butterfly and snipped the antennae off that and stuck it on mine!!! What a pretty card, Karen! It looks like a fabulous set! Lovely card with gorgeous butterfly! And, a very pretty stamp set! Enjoy your weekend! Love seeing the butterfly be the center of the card!! Fabulous card, Karen ! Love the orange and black colors and the “CAS” look. 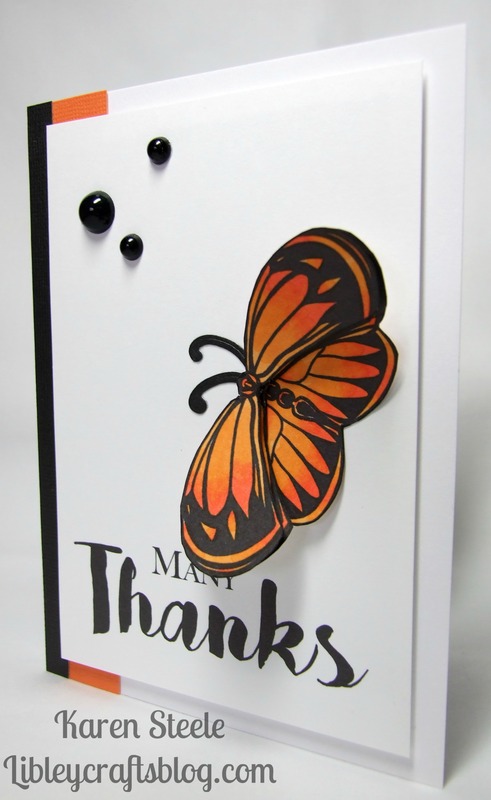 Love the big sentiment in front and the layered butterfly looks great ! I really love the look of this card, everything got its perfect spot and you’ve added just the right amounts if orange and black. The design is beautiful, it feels both contemporary and classy. Gorgeous card, Karen! It looks just like a Monarch Burtterfly! That set is really beautiful too! Gorgeous card, Karen! Love the butterfly and pops of orange! Karen, this is gorgeous! I love the colouring and layering of that butterfly. It certainly does pop from this beautiful card.